Thacher Vineyard 2016 “Working Holiday”; Cass Vineyard, Geneseo District; Paso Robles, CA. 13.4%ABV, SRP $28/bottle. Stelvin closure. Color is an opaque, deep ruby with a nose of mixed fruit, showing black currants, blue plum, and mature raspberry. On the palate, a tasty blend of dark blue plum leads to blackberries and a secondary melange of spice notes: thyme, white pepper, and cut greens. 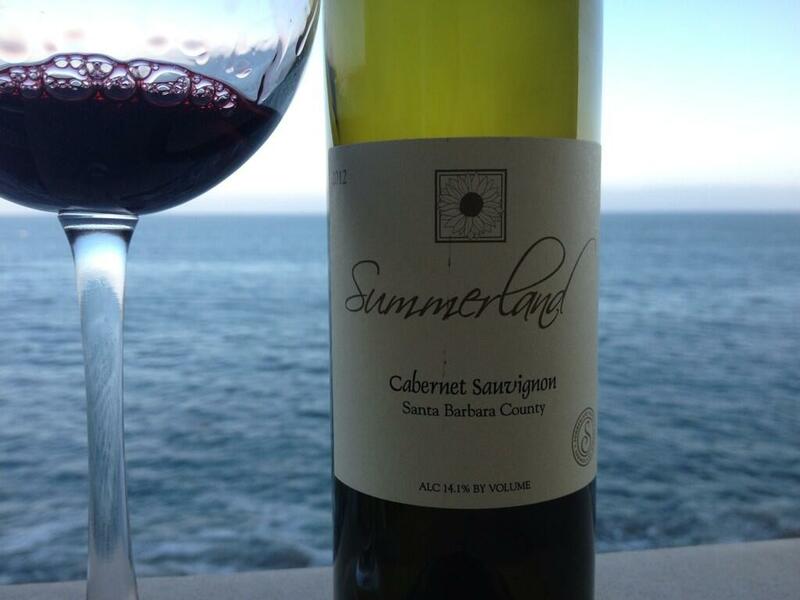 Medium bodied yet with full-flavor, this wine exhibits a nice acidic backbone and a solid tannic baseline. A classic Rhône-inspired GSM with lovely Central-Coast fruit, subtle use of oak, and a real sense of “holiday” that the name implies. A blend of 47% Grenache, 30% Syrah and 23% Mourvedre, the wine stayed consistant over the course of several days while I paired this, enjoying it at every turn with Italian pasta, a Mediterranean chicken dish, and braised red meat. This is a small (248 case) production from a talented winemaker- a classic wine approach with what tastes like a blend of modern and ancient techniques. 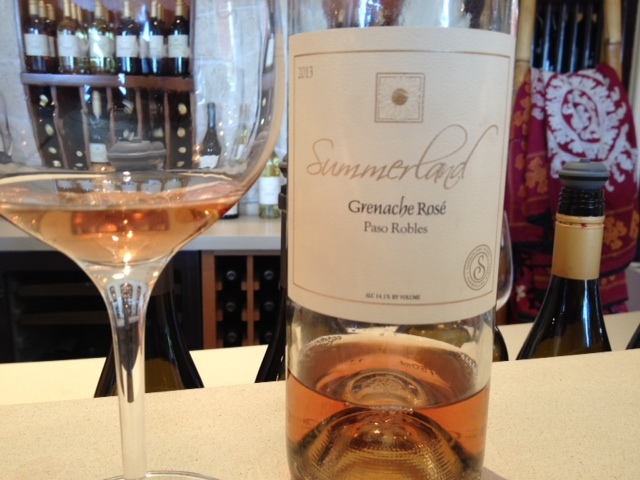 I’ll keep an eye out to find more wines like this from Thacher and more from Paso Robles. You should do the same, as this is a solid wine that delivers robustly, and promises more in the future. Ten years after buying vineyards in Maury, France (the Roussillon appellation), winemaker Dave Phinney’s release of his latest venture, called Department 66 , has finally hit the USA. These are wines that don’t taste like Phinney’s previous winemaking undertakings; to his admission they are small cluster, tiny yield (only one-half ton per acre!!) and most of the vines are from 60-100 years of age- which delivers a concentrated mouthful of flavor! Department 66’s “Fragile” 2017 Rosé of Grenache, with small amounts of Syrah and Carignan. Maury, France. 15% ABV, SRP $18/bottle. Color is pale pink with just a hint of orange. The nose is of fresh spring strawberries. The palate is a pleasing shot of young, tart strawberry up front, showing bright acidity with a hint of bitterness on the back palate. Heat sings across the top palate from the high ABV, which I only noticed because I was looking for it- others won’t mind, as the tongue is too busy enjoying the dancing red berries and tangerine rind on the front palate. I poured this for several neighbors who, like myself, were simply enchanted by the wine on their very first sip. Best served cold due to the high ABV. This is the rosé you didn’t think you were going to love until it hits your mouth. It is so “not Provence” that I want to call it an Anti-Rosé. If you like grenache (aka garnacha) and GSM blends, your mouth just might thank you. It is a delicious, decidedly different approach to a different peak, with an entirely different view of what it means to be a rosé. Department 66’s “Others” 2015 Grenache (with Carignan, Syrah and Mourvèdre) Catalan Red Wine Blend; Maury, France. 15.2% ABV, SRP $25/bottle. Color is a dark, opaque magenta. The nose offers juicy red plum and chrysanthemum. On the palate, a mixture of dark fruit: cassis, black plum, blueberry with blackberry jam with a touch of forest floor. On the extended finish there are notes of floral herbs, oak, saddle leather, granite, and schist. A monster mouthful of juice that wants to run down your mouth like berries so plum they explode on contact. This is a big, full-bodied grenache that is best served just under room temperature and is perfect for smoked and grilled meats, or other powerful flavors that will stand up to bold tannin and structure. Cabrales cheese, spicy sausage, or savory dishes with heavy sauces could be alternate pairings. The Spanish influence is quite apparent, and if tasted blind I would have suggested Northern Spain, not France. 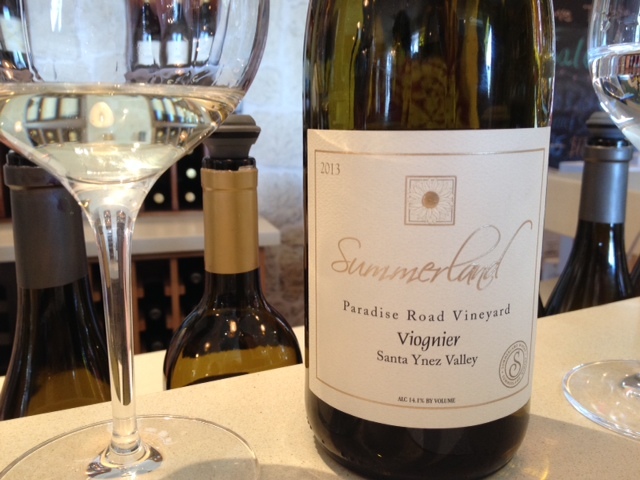 This wine possesses big and bold flavors in a way that juicy California blends have never imagined. Dave Phinney’s wines have mesmerized me since my first taste of The Prisoner many years ago. He plays by his own set of rules, making delightful wines outside of the standards of the big winemakers, and without corporate constraint. Department 66 is a decidedly different beast, by Phinney’s own admission. He has matured, learned, and this is a new venture, seemingly a personal aspiration. I am fascinated to see what Phinney does next! Markus Wine Company, “Sol” 2015 Vintage Red Blend, Lodi, California. 14.9% ABV, $39 SRP. Dark purple, nearly black in color near the center, with purple edging. Busy, eclectic nose of dark fruit, forest floor, sand, and eucalyptus. On the palate, massive black fruit: plum, blackberry, black cherry- the violence in the crush is evident- this is a big, blasting stroke of bold flavor. A big mouthfeel, strong tannins, acidity, and fruit; secondary notes of mocha, vanilla, and salty sand- this is a huge wine with a long, Grand Canyon of a finish that goes on, and on, and echoes far past when you think the last note has ended. This wine screams for grilled meats but can work beautifully with Mexican, Italian, I even made it pair with a salad by adding some grilled chicken and a few slices of jalapeño! This wine is fun, fabulous, and a ton of black fruit flavor. Made of 42% petite Syrah, 37% Syrah clone 877 (both from Borra Vineyards), and 21% Mourvèdre from Silvaspoon Vineyards. Each time I tasted this wine, I wanted it to be named “Black Dog”, after the Led Zeppelin song whose protagonist is in constant, amorous pursuit- because the black fruit is so forward and direct on the palate. Its driving, electric, bluesy desire never gives up! When you want an incredible night, put some massive steaks on the grill, pop open a bottle of Markus Sol, and let the music flow! Adrien Roustan Domain D’Ouréa Vacqueyras, 2011, Rhône, France. 14.5%ABV, priced on the internet from $27-32 per bottle. From France’s second Rhône appellation to receive AOC (after Gigondas) comes a delightful, rustic, powerful and tasty red blend. Color is deep crimson (nearly maroon) with ruby edging. The nose offers dark red and purple fruit with herbs and a powerful waft of alcohol. The palate is huge -a big bang of its own, a cannon shot across the bow- showing ripe red fruit, nicely demonstrating the traditional blend of syrah, grenache and mourvèdre expected from rhone reds. After the initial impact, the palate shifts into a darker series of gentle woodsy flavors with saddle leather, potting soil, and a medium-long, bold and savory finish with elements of clay and calcium but missing the obvious notes of wood, steel, or concrete. A hint of effervescence dissipated after the initial taste. This wine came to me as part of a grab bag case from Garagiste and is simply a delightful wine. Were I able to find more of it at under $20/bottle I’d be quick to pick it up; at the internet prices I saw the wine offers medium-pricey but massive flavor for a tasty and well-made biodynamic wine. Compares easily to mid-level Gigondas and other bold Rhône blends price-wise, but not a killer value. Taste the Mediterranean- On a Budget! “Tala” Monastrell 2012, Alicante, Spain. 14.5% ABV. Bottled exclusively for Astor Wines & Spirits. $5.96/bottle. Showing a violet color with ruby edging, the nose is ripe red fruit, menthol and slate. Tart raspberry and cherry meet green stalkiness on the front palate,secondary notes of pepper, spice and stone are followed with a dry, tight finish. Better than a basic vin du table, this wine shone when paired with food. On its own, the acidity may be overpowering, but with a basic pasta & meat sauce, Tala cuts through and leaves a fresh, clean palate. It reminded me of dining outdoors in southern Spain, looking out from the restaurant to view the Mediterranean sea. I enjoyed the fruit, strong tannins and acidity on my initial tasting of the wine by itself, but preferred Tala on the second day when I took time to enjoy it, and pair it with an appropriate dish to match the spanish grape. A good party wine at a superbly low price, I’d suggest opening to air for 30 minutes prior to service or decanting for best enjoyment. I’m not used to liking much I’ve found under $10 but Tala and the Horgelus have enough to make anyone pay attention for good value. List price $14/bottle. 13.5% ABV. Samples provided by McCue Marketing. Light ruby in color with a nose of fresh, sharp cherries, hints of cola and saffron. Cherry and red plum are the dominant fruit flavors on the palate. Holding the wine in my mouth, I pondered the experience: an unexpected, ideal expression of the grape. The clean finish made this wine feel like a pricier burgundy to me, but without the historic wooden barrel effects. Notes of gravel and chalk appear on the medium finish. Overall, my response is a great balance of fresh red fruit with a good acidity and tannin. Juicy, tart, and mouthwatering, you can drink this all day without getting bored, or start the evening with it and move on to pair it with lighter fare up through a fish course. Bright violet with a purple center and ruby edging. 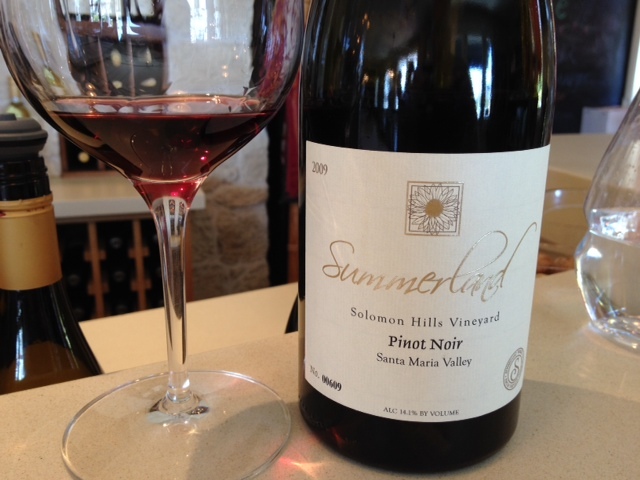 Ripe red fruit on the nose with herbs and wildflowers. On the palate: soft essence of cassis, boysenberry. Short notes of clay and lime and a long, tart finish. Concentrated, singular and enjoyable, I expected this was a single vineyard before I looked at the label. Paired perfectly with spicy marinana sauce, strong cheese, and spicy food- such as Thai or Mexican, I made fajitas specifically on the second night of tasting this and was wowed by how nice the pairing was. The bright acidity and ripe fruit will allow the wine to cut through the palate when served with powerful flavors such as duck or a bourguignon sauce. Another surprising value from winemaker Jean-Claude Mas. List price $27/bottle. 14.5% ABV. Samples provided by McCue Marketing. Deep purple color with violet edges in the glass; the nose exhibits a lush blend of dark blue and black fruits. On the palate, the initial rush of blackberry, black plum, and currants are met with spice, licorice, oak, and a green vegetation note that hung across my top palate. 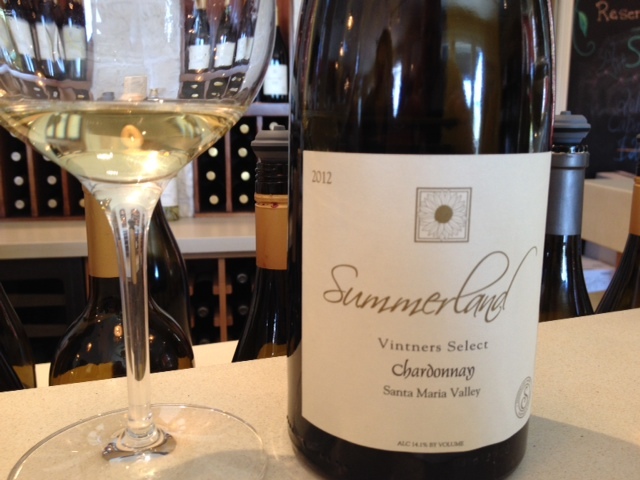 Limestone, gravel, and mocha notes appeared during the lengthy, oaky finish. This is a wonderful old world blend with modern efficiency. Speaking of the blend, it is 50% Mourvérdre, 30% Syrah, and 20% Grenache. Centuries of rustic charm on sun-beaten vines meets finesse with the relaxed tannins pulling forward after the liquid has moved below. 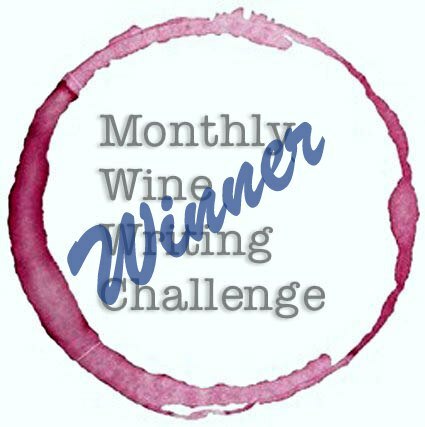 Powerful, invigorating, and complex are my initial overall impressions, and they stayed consistent as I came back to this wine time and time again. Over four days the nose and fruit aired nicely and developed without losing quality. You can enjoy the 2011 now at this ripe young age, but the smart buyer will pick up a case or three hold this six to eight years and taste it to see how the tannins and fruit mellows over time. I’d think this wine would cost at least twice as much for the quality, so enjoy it before everyone starts to stockpile and drive the prices up. About the winemaker: Jean-Claude Mas is a fourth generation winemaker who began work with his family’s winemaking at the age of three. He ascended to run the family business (begun in 1892) in 2000, and has expanded the acreage and updated the technology to mass production, including pneumatic pressers and stainless tanks. 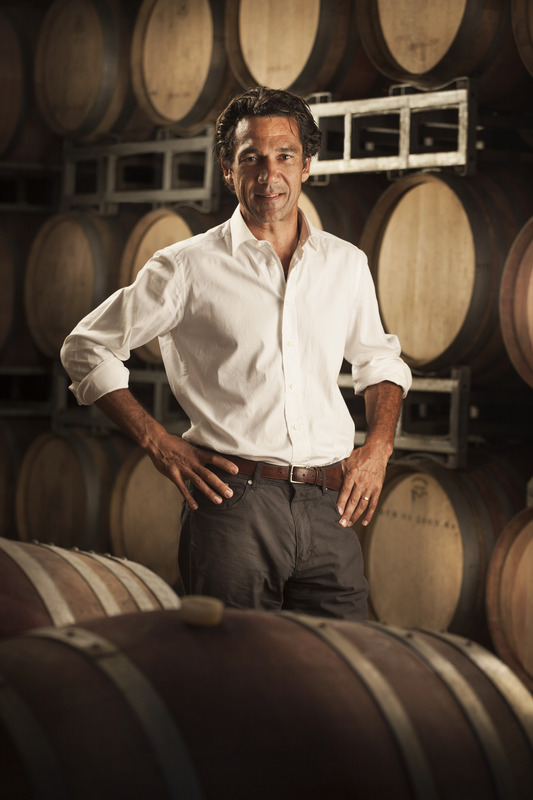 The brand Arrogant Frog are among his most visible successes and he has been named International Mediterranean Entrepreneur of the Year by Ernst and Young and the Domain Paul Mas was named Winery of the Year by England’s The Guardian Newspaper under his helm. 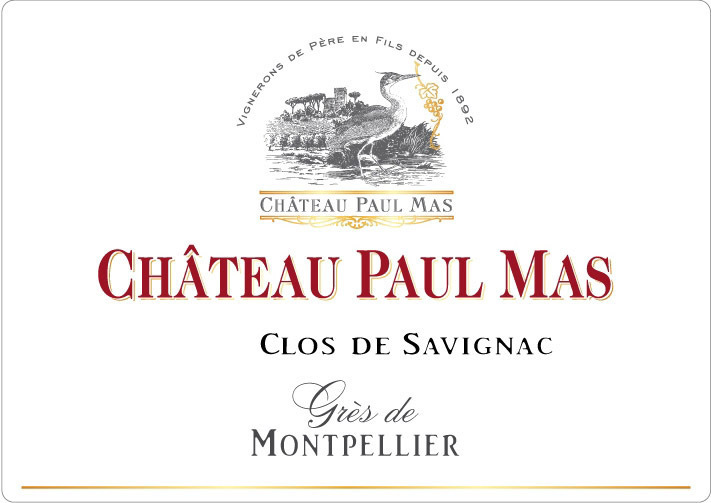 Paul Mas wines are carried nationwide by BevMo and other fine wine retailers. 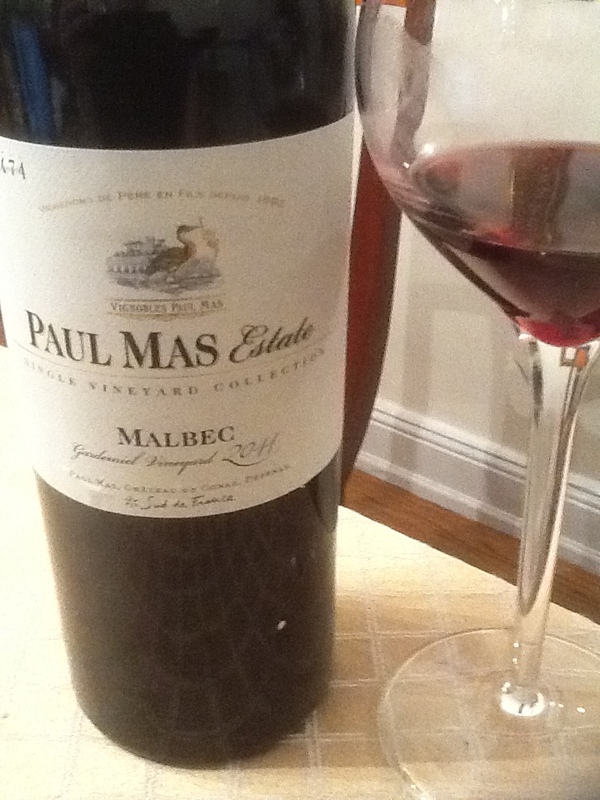 In the NYC area Paul Mas wines can be found at Beacon Wines & Spirits, London Terrace Liquor Shop, Phillipe Wine & Liquor, and 120 Wine & Liquor to name a few locations in Manhattan. More about Domain Paul Mas can be found at their website, www.PaulMas.com. Color: Ruby center edging in garnet. 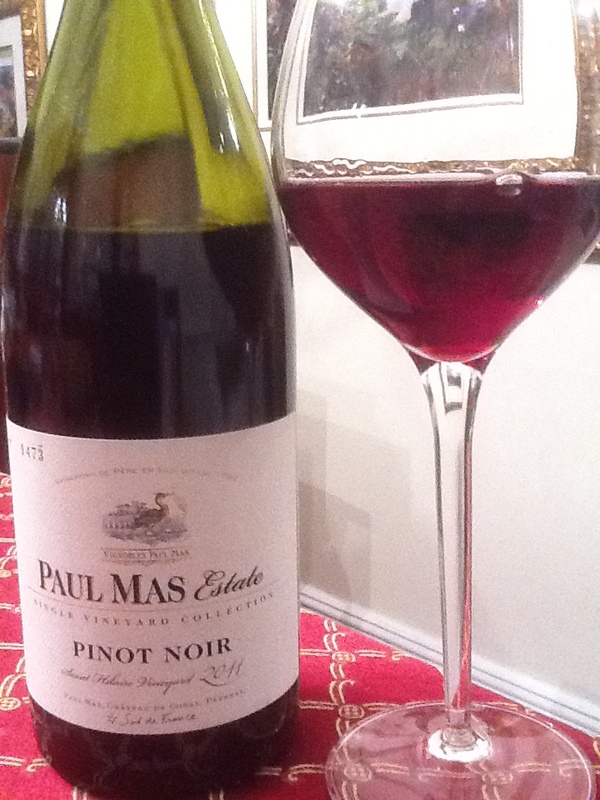 Nose: red and black plum with violet, touch of spice. On the palate this wine shows boysenberry and cassis up front with loads of pepper, some earth, notes of oak, clove, and limestone on the finish. Nice balance, medium body, shows more depth than many young wines. Great value. An impressive blend of grenache, syrah and mourverdre grapes to develop a tremendous wine at this price and age. Consistent work from a talented winemaker whose stable includes Chateau Beaucastel and La Vielle Ferme. If you like French wines, don’t miss out on this one- it’s a great deal at this price and shows very well compared to wines priced at double this. Check out more about Famille Perrin’s wines here. Here’s to a great 2012 send-off, and looking forward to an amazing 2013 with my readers and fellow oenophiles. My brother-in-law went to a big-box store in search of a good red wine value for dinner and came up with this! 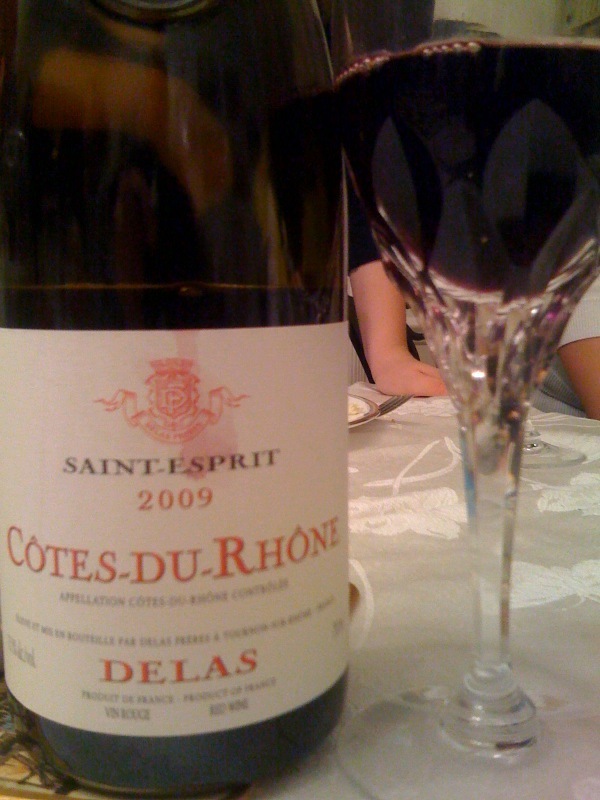 A solid value in a good red table wine that has also received a 90 point rating from Robert Parker, this Delas Freres St-Esprit ’09 Côtes du Rhône has a nice ruby-purplish color with a nose of red ripe fruit and herb garden with hints of white pepper and vanilla. 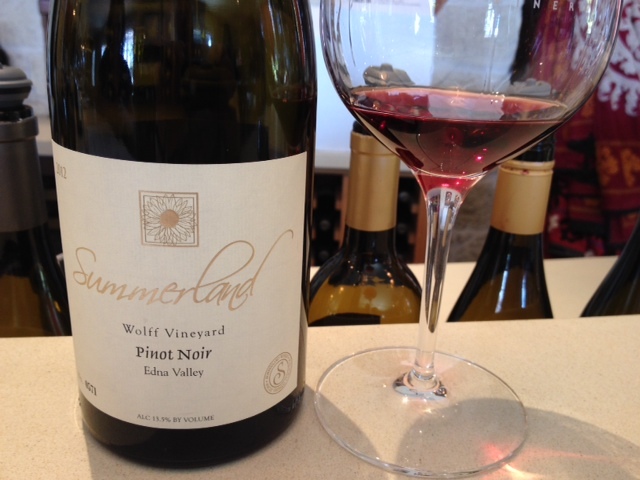 The palate is full of raspberry, cherry, licorice, and spice with notes of loam, earth and gravel on the finish. A well-balanced combination of fruit, acid, tannins in a tasty wine that pairs quite nicely with most foods, easily with fowl or medium to light fare. At $10-12/bottle, don’t pass this by if you see it in your aisle without trying it. At this price point, it’s a steal. You can find out more about the vineyard, winemaker and importer here. I started drinking the Meffre Reserve red wine almost a decade ago when a local wine shop owner showed it to me. “This is one of the best buys I have and it’s delicious,” she said to me quietly, “you should really try it.” Her preference and shop stock was largely Italian wine, and to crack open a wooden case of Meffre Châsse Côtes du Rhône for me in the back of her small store demonstrated her passion for the brand. I bought the bottle, tasted it that evening, and went back for more later that week. Since that time, I’ve watched and tasted as the winemaker has evolved in their approach to wine and marketing. Today in addition to the reserve, they offer other red blends listed as ‘tradition’ and ‘prestige’ which may be listed depending on the year as ‘winemaker’s selection’. Note the interchanging of synthetic corks and screwcaps in the modern bottling, as well as the custom-inscribed bottle. That’s all good for packaging, but how is the wine? 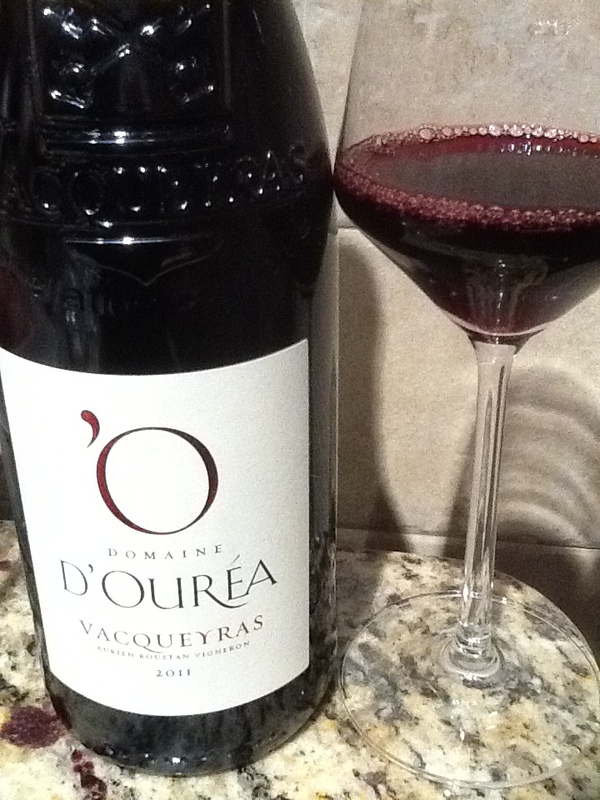 In common French style, this is a blend of four grapes: grenache, syrah, cinsault and mourvèdre. That means to the casual drinker that the wine is a deep red with purple tinges in the glass. It has ripe red fruit and violet on the nose. The palate has red plum, raspberry, and black currants, licorice, with notes vanilla, pepper, limestone, clay, and a touch of oak with a tight finish. It’s fruit forward and spicy, “chewy” is a word often used for younger wines made for drinking now and not aging or cellaring as most Bordeaux wines would be. The only thing I don’t like about this wine is the number of accent circonflexes (that’s the little roof accent above the a, o or u) you should type when reviewing it for your blog. Yes, I’m kidding…well, only a little. Purchased locally at $12/bottle, available online from $9-14/bottle. If you are interested, you can see the entire line of the La Chasse brand of wines here. and winemaker Gabriel Meffre’s site is linked here.